THE Federal Government intends to replicate the robust Lagos economy in other parts of the country using the Inland Container Depots, Executive Secretary of the Nigerian Shippers Council, NSC, Hassan Bello, has said. Bello, who made this known in his officer in Lagos, said government plan is to focus on exportation of law materials and other finished products from these new facilities. He noted that export through these facilities would reduce time wasting and damage to goods as a result of bureaucracy at the ports in Lagos. Recall that over 70 percent of goods exported from Nigeria go through the ports in Lagos. Bello explained that the federal government emphasis on the completion of the ICDs is as a result of its belief that the projects when complete could help in the drive of replication of the Lagos economy in states where such facilities are situated. 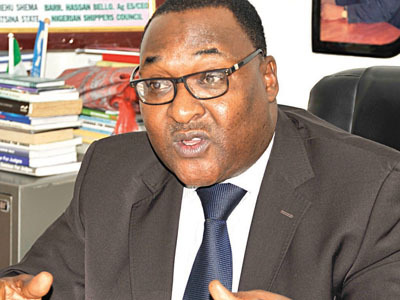 According to the Shippers Council boss, “We must bring shipping services close to shippers, we have to replicate the economy that we have in Lagos in all these areas. Even more importantly is that we have to export; if Nigeria does not export it is going to perish. “We have all the potentialities. Although we have cocoa in Ghana and cotton in other countries, the Nigerian cocoa and cotton are most desirable, even our crude, our own Bonny light have some peculiarities. “So, we need to export through the dry ports. All the problems of coming through the Lagos ports, spending several days before they are exported will be solved. With the ICDs, we have all the cargoes consolidated in one place and taken by ship to Lagos or wherever where the ship is waiting to ship them out. “It sound very simplistic but that is the aim of the Nigerian Shippers council. To have modern transport infrastructure because that is what drives modern economies. Everywhere you see a striving economy you will see that the transport infrastructure really works. TTP is a public rest area located off the road, designed to provide temporary rest location for truck drivers. It is primarily intended for short-term breaks and also long-term parking services. Recall that the ICD in Kaduna has been completed and has commenced operations while work in ongoing in those located in Plateau and Abia states.